Dozens of people are now living in a remote camp set up in northern B.C. in response to a recent injunction order from the B.C. Supreme Court to allow for pipeline pre-construction activities to take place in the area. Dozens of Indigenous people and their supporters have set up camp in a remote part of northern B.C., using a strategic access point to control who can get into the territory, as RCMP officers set up nearby. Standing in a cooking tent at the Gidimt'en camp, people mill about making soup, brewing coffee and chatting. Some sit huddled around a small fire outside, snow falling all around them. But they're not sure what will happen next, after more than a dozen RCMP officers have checked into a hotel in Houston, the nearest town to the Gidimt'en camp. The camp was built following an interim injunction from the B.C. Supreme Court in December to support Coastal GasLink with starting construction on a nearly 700-kilometre pipeline through the territory. Coastal GasLink has said it needs access to the area as soon as possible to meet construction deadlines for its role in an estimated $40-billion natural gas pipeline and transformation plant. The Gidimt'en camp is the latest move to assert opposition to the construction of oil and gas pipelines in Wet'suwet'en traditional territory. The Gidimt'en are one of five clans that make up the Wet'suwet'en. In total, there are 22,000 square km of Wet'suwet'en traditional territory in this northern region of B.C., an area that was part of the landmark Delgamuukw case where the Supreme Court of Canada confirmed the Indigenous nation's land rights and title had never been extinguished. "I am very honoured to have all my brothers and sisters here with us to stand with Gidimt'en," said elder and Gidimt'en clan member Chief Grizzly Mama. 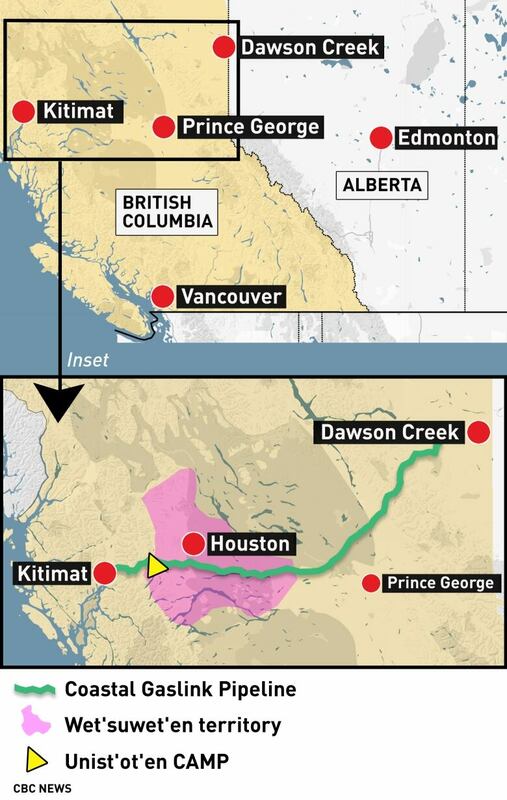 Coastal GasLink has made agreements with all of the elected Indigenous band councils along the pipeline route and says it's been consulting with hereditary leadership of the Wet'suwet'en for years about the project. But a release put out by the Gidimt'en camp states, according to Wet'suwet'en law, the company "has never received permission from the proper title holders to access any Wet'suwet'en territories." The Gidimt'en access point camp was established a couple weeks ago and has grown quickly to include several permanent structures to accommodate the people staying there. 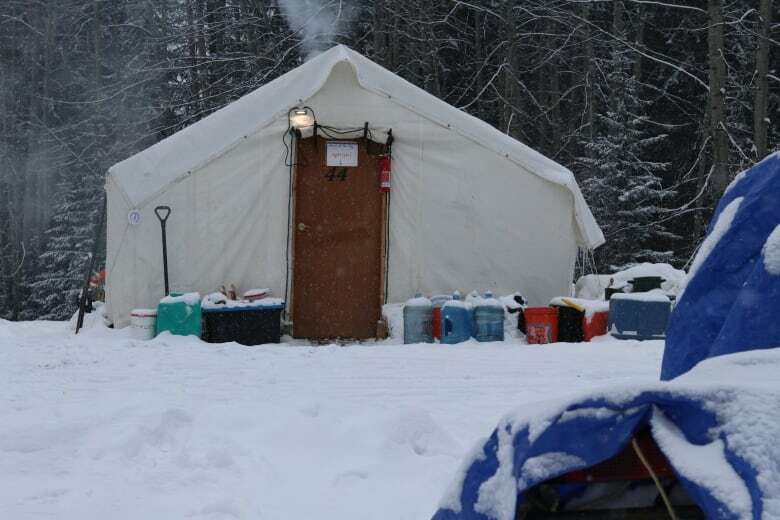 About 20 kilometres away sits the longstanding Unist'ot'en camp, which was established in 2010 and has long stood in opposition to oil and gas development in the territory. Both camps are opposing the building of the Coastal GasLink pipeline, designed to transport natural gas from northeastern B.C. to a liquefied natural gas plant slated for construction in the north coast community of Kitimat, B.C. Several of the people at the new Gidimt'en camp have come from Indigenous communities across Canada and the U.S. to support the Wet'suwet'en. They say Coastal GasLink is not welcome to build a pipeline in their territory without the consent of the hereditary leadership. Cody Merriman is Haida and married into the Gidimt'en clan. He said he's supporting the camp as part of his obligation to protect his wife's territory for their two children and the clan's hereditary leaders. "This is where we live our lives ... this is where my kids learn to hunt, this is where they learn to snare," he said. The anti-pipeline group says logging companies and others are given access to move through their gate without issue. This gate is the second of its kind to be constructed on the planned pipeline route. Merriman said they're not sure what to expect from the RCMP in the days ahead. He said he realizes what they're doing is being characterized as unlawful activity. "And I think back … you know what, the RCMP lawfully assisted in taking our kids to residential school," he said. "My argument is, whatever is lawful, doesn't mean it's right." In an emailed response to CBC on Sunday January 6, RCMP media relations contact Madonna Saunderson wrote that she understood there are " less than a dozen officers in the Smithers area, including our Division Liaison Team (DLT)" but that "you may notice an increase in resources in the detachment area this week/month." She confirmed that the injunction and police enforcement order recognize the RCMP's discretion to decide how and when to enforce the injunction, and that they are "hopeful that there will not be violence or disorder as we enforce the court order; however, the safety of the public and our officers is paramount when policing demonstrations, particularly due to the remote area in which the bridge is located."